- The early Republican helmet and the shoulder doublings worn by Marcus Scipio are patterned after armour worn by Roman legionaries during the Second Century BC. They might have been worn at the battles of Zama or Pydna. 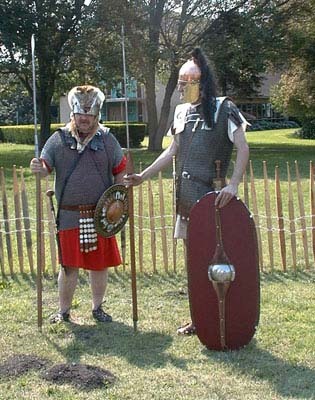 The early Republican helmet and the shoulder doublings worn by Marcus Scipio are patterned after armour worn by Roman legionaries during the Second Century BC. They might have been worn at the battles of Zama or Pydna.